Beautiful fall colors. 75 degrees. Windows open … especially the ones I am staining during the first two of a three-step process. Keeping up with the leaves a bit at a time seems to be a better strategy than half killing myself in a marathon of gathering and bagging. The front yard and most of the backyard took little time this morning. Spent time on the roof as well this morning. Tomorrow’s forecast is for moderately heavy rain, and piles of leaves and pine needles needed to blown out of roof valleys and off of the gutter screens. Leaks and stained ceilings are not in our decorating plans. A neighbor lady walking her dog looked all around our yard for the source of the blower noise. Her reaction was amusing when she finally located me on the top of our house. The bathroom skylight always gets a thorough cleaning as long as I am up there. This entry was posted on November 2, 2011 at 12:25 pm and is filed under Homelife. You can follow any responses to this entry through the RSS 2.0 feed. You can leave a response, or trackback from your own site. 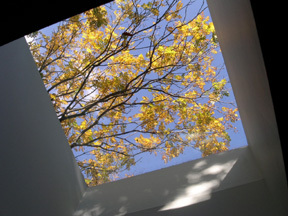 What a lovely photo of your skylight! You must be able to grow houseplants in the shower, right? That room was a cave! At mid-day, guests could not find the light switch. We have had a square of moonlight appear on the floor filled with the pattern of bare winter branches. An incredible sight, a gift.